Professor Michael Fuller (right) confers with the Assuri Christian Archbishop of Hasake (center) and several priests from the Syrian Orthodox Church of St. George in Hasake. Ibrahim Nanoo (left), representative from the Hasake office of the Department of Antiquities listens and helps translate. 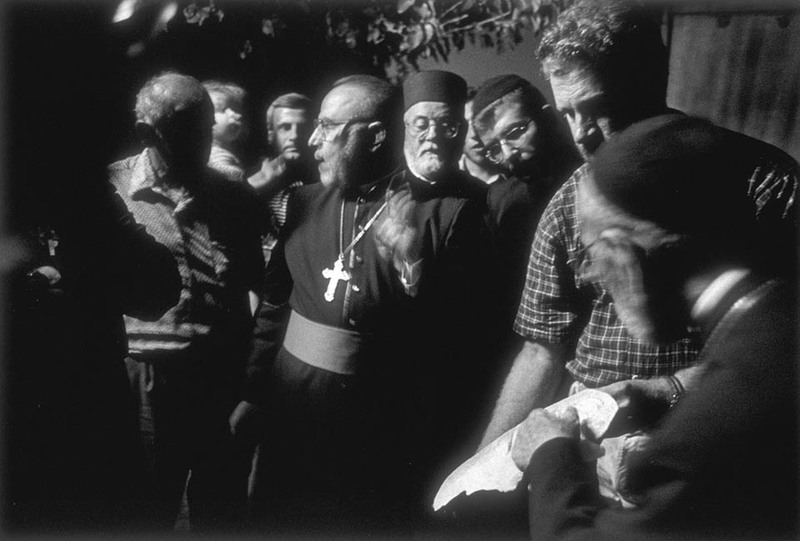 Salebo holds an infant Amira Fuller between Abou Nidal and the Assuri Archbishop. A close parallel to the Area 3 church is the village church in Tell Sakra, Syria. The church is used by the Assuri Christian (Church of the East) community. The church was built in the 1930s out of mudbrick. The walls have been encased in concrete and plaster. View of the methbah (Syriac, altar). View of the podium in front of the hiakal. View of the podium left of the hiakal. Last updated 17 February 2005.